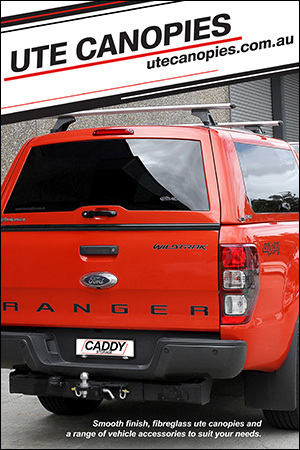 Caddy Canopies import and distribute a range of quality Fibreglass, colour coded Alpha Ute Canopies for the Australian automotive industry for vehicles manufactured by Toyota, Mazda, Ford, Mitsubishi, Holden & Isuzu. With offices and distribution outlets nation-wide, we can ensure to deliver your ute canopy wherever you are and whenever you need it. Our head office in Sydney is set up to hold over 300 canopies at all times which are ready for immediate fitting. We also have stores located in Melbourne, Brisbane, Perth and Adelaide, accompanied with over 200 distributors Australia wide. To accompany your ute canopy, Caddy Canopies also offers you a large range of ute accessories to suit your personal or commercial requirements such as front protection bars, roof racks, ute liners, ute drawers and shelving and vehicle flooring options. Picture taken at Caddy Storage Blacktown. All of our stores have well equipped showrooms which are available for viewing at any time during business hours. Visit us to see realistic ute body displays for a hands-on experience with our ute canopies and general products, and speak to our sales staff to find the best vehicle storage solution for you!